Fiwygin Outdoors Presents Asha's 14th Annual Celebration of Winter! Join us at 3pm Saturday, February 17th at Crosby Regional Park in Saint Paul for yard games (think bean bags, ladder golf, etc), exploring (think hiking, wildlife tracking, meandering, birding, etc) and of course a bonfire/hot chocolate/smores! We'll bring a few pair of skis and snowshoes, a bunch of yard games, and plenty of firewood and snacks. Come spend time outdoors with us. We'll hang out at the park until about 5pm, and those who want can head up the hill to Summit Brewery (which like all our events, is kid friendly)! Ninja Sushi is the scheduled food truck for the night, and there will be an opportunity to donate to a local non-profit (TBD sooner than later) if you are interested. All are welcome, with an extra shout out to those who are underrepresented in outdoor spaces. There will be activities for all, so even if the "outdoors isn't your thing," we'll do our best to make sure you stay warm and even have some fun! Hit up asha with any questions or concerns. This event (as are all of our events) is free of charge. We hope you join us for some or all of this exciting celebration! Last year's 13th Annual Celebration of Winter was also held at Crosby Regional Park. The fall colors are beautiful, the weather should be crisp but not frigid, and thanks to the DNR, we have access to 6 canoes on Sunday morning! Who: Everyone....really. And, we give an extra shout out/invite to people who are underrepresented in outdoor spaces. What: Canoeing (and fishing!) on Snelling Lake, at Fort Snelling State Park. Where: Fort Snelling State Park -- check in at the main ranger station (when you first enter) and then head to Snelling Lake. If you need a ride, we'll have a car going Saint Paul in the morning. When: This Sunday October 22nd at NOON. (Note, it was originally scheduled for 9am, but we moved it back, since it will be warmer around noon). Why: Because it's gonna be a great opportunity to get your paddle on! What to bring: Warm clothes. It still may be a bit chilly at noon, so we recommend bringing a jacket, hat, and gloves. We'll bring extra warm things in case you forget. Canoes, paddles, life jackets, and fishing poles will be provided. Cost: The event is free (thanks to the DNR for the canoes), but there is a $7 entry fee per vehicle for accessing the park if you don't have a state park annual sticker....HOWEVER, Fiwygin Outdoors is more than happy to cover this cost -- just let us know (i.e. send us a text at 651.295.2773 when you get there). Questions? Hit us up -- Fiwyginoutdoors@gmail.com or 651.295.2773.
Who: Folks who want to spend time outside (with an extra shout out to those who are historically underrepresented in outdoor spaces). What: A picnic and some quality outdoor time. It's going to be beautiful outside today! Where: Harriet Island Regional Park. Wabasha Street bridge is closed, so use Robert Street bridge instead. We'll be near the pavilion. Call 651.323.3303 if you get lost and we can help guide you there. When: Today, September 3rd at 5:30pm. Optional things to bring: a water bottle, food, blanket or chair, anything that's fun to do outside (bike, kite, lawn games, etc). We'll bring some food, a football and a frisbee. Optional things to do: There's a great path along the river -- for biking, walking, running, wheeling. With the river there, you can fish, canoe, etc. We won't be bringing our canoe, but if you want to bring a watercraft, you are more than welcome. Fiwygin Outdoors -- Sunday August 6th! Exploring + Wildflowering! Join us this Sunday evening, August 6th -- Fiwygin Outdoors will be at Theodore Wirth Park.We've not yet checked out the wildflower garden this summer -- so we've decided we'd better do that before the flowers are gone and the snow falls. For those who want to get some extra movement in -- meet at 5:30pm (sharp...seriously) at the beach houseif you want to hike (walking, running, biking, wheelchairs, and strollers are all welcome) with us -- so we can meet everyone else at the top/entrance of the wildflower garden by 6pm. If you choose to meet at the beach house at 5:30pm (or earlier, since we will depart by 5:35) -- there will be two route options. One is 1.5 - 2 miles and one is probably less than 1 mile, but not by much. Both have some hills (especially the longer version) and are on grass trails. If you don't want to take the long way -- meet us at the front entrance/parking lot of the Wildflower Gardensat 6pm. There is metered parking available at the front entrance -- we will bring some quarters to help cover that cost. We will have a naturalist/plant nerd with us to help explain all the rad flowers at the wildflower garden. We will also bring some snacks, bird books and binoculars. If you're late, please give us a call (651.295.2773) so we can either wait for you or tell you where to meet us. Bring yourself, and bring your enthusiasm. Let's check out these wildflowers before they disappear for the season, and have some fun! Photo from the wildflower garden in 2016. Photo credit -- Theresa Terry. This blog has been primarily used for Fiwygin Outdoors promotion. Today I am shifting the focus to "Pride" as it's been heavy on my mind and heart this year. This year, when the police were asked not to have a presence at the pride parade, people got upset. LGBTQ white people and LGBTQ police officers repeatedly said "pride has always been for everyone, it's always been inclusive, and now folks are excluding us and dividing us." This notion of "for everyone" and "inclusiveness" is not true, and it scares me that folks think it is. I've never considered Pride (or Gay Pride as it's often referred to) as being INCLUSIVE or welcoming to me. Yes, in the past I've marched in the parade -- and at the time, was damn proud to do so, but as I've gotten older and seen more and more how divided the queer* community is, the more I am disheartened and upset. *Please note that I'm using queer as an umbrella term for all folks who identify as LGBTQIA (etc). **Please also note that this post is my experience and my words only (unless otherwise noted), and is not being shared or written on behalf of any community. More and more, the polarization became clear as did the separation of POC (people of color) and white folks. Microaggressions became macroaggressions. Things like Soul Friday (a night of dancing for "queer women of color and their friends") became more and more overcome with cisgender white men, feeling the music while slowly (or quickly at times) pushing me off the dance floor. There was a summer a few years back, when people of color got pissed because all (or nearly all) of the musicians of color were booked to play at one stage -- I believe it was the "power to the people" stage. Why couldn't they play the main stage? Even when I marched in the parade (a few years ago), with a diverse group of people (ability, age, race, gender), it was still the cis-white men who carried the banner and led our group. QTBIPOC*** were intentionally segregated and pushed aside, but this is nothing new. Four or five years ago, when marriage equality was the big fight in Minnesota, folks came together to support it. Even straight folks had "vote no" (to the marriage amendment) signs in their yards or bumper stickers on their cars. I remember sending a photo to Minnesota United for All Families -- of me (not white) and my girlfriend (white), in hopes that we would make it as one of their highlighted couples on the website or their Facebook page. 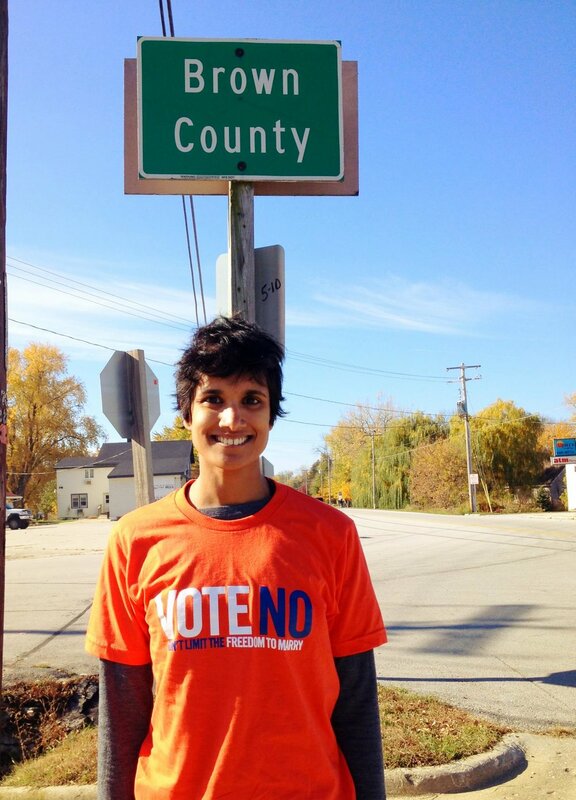 I also sent a picture of just myself, wearing a "vote no" t-shirt that was common among folks in the twin cities during that time. Neither picture got posted, and I didn't understand why. Didn't they want photos that represented people who might someday want to get married? One of two pictures I sent to MN United -- in hopes of diversifying their homepage and facebook page, since very few folks on either page "looked like me." I remember volunteer phone banking for MN United a few days before the election, and when I got there, I was one of a few people of color there. I asked someone where all the people of color were, and was told (by a person of color) that this campaign wasn't for people of color. I told her about the photos I sent in, and she explained to me that she was unfortunately not surprised that the photos didn't make the website. She told me that in order to win the campaign, they needed white, middle class, approachable looking people to be the face of the campaign -- since that's whose vote was needed to get the win. In order to pass marriage equality, folks needed to look "safe" and appealing to middle class white people, as they are who vote most frequently, and make up the majority of Minnesota's population. I finally understood how deeply racism was rooted into this campaign. While it may sound like this person's words were harsh -- they were not. They were exactly the kind of truth that I needed to hear -- that I needed to fully understand why my photos and my presence were not a part of the campaign. This played out when my (white) partner and I went to the capital after the marriage amendment passed. I jokingly said, "lets go down to the capital, so I can get on TV." We stood in the back of the crowd, watching white folks give the "rah-rah" speech, while a few people of color stood on the stage but never spoke. They were simply there as tokens. A reported came up to us and asked to interview my partner. Knowing I wanted to "be on TV" she said, "my partner has some good things to say -- interview her." So I got interviewed, and essentially said "This is great news for Minnesota, but we've got a lot of work still ahead of us to make sure that all people in the community can thrive." From what I remember, I didn't mention specifics or get into details, because I knew if I said Black Lives Matter or Trans Lives Matter, I would not make the cut. I kept it middle of the road and hopeful. I told my boss that I was going to be on the news, and might as well had popcorn as I excitedly watched for my moment to shine. Well, I didn't shine, because my part had been cut from the reel. My articulate, middle of the road, optimistic 30 second interview had been completely cut out. I went to the news stations website, to see if there was an alternative version. There wasn't. I was literally cut out of the narrative, which is what happens to POCs and trans folks in the "community" all the time. Does this mean POC and trans folks don't matter? Yes, and no. Yes of course we matter -- we are human beings, just like you who is reading this. But no, we don't matter when you look at campaigns like marriage equality or just about anything the HRC (Human Rights Campaign) does. We don't matter in pride festivals or news stories. Don't believe me? Think about how many folks in your life were involved with the marriage amendment/equality. Now think about how many of those folks are still actively fighting for trans rights, queer youth, and queer folks of color. Not nearly as many -- and especially not at the rate that they were fighting for marriage equality. While it's not necessarily a competition of which issue matters more, and how many folks are involved or fighting the good fight, it is a matter of humanness and the value that we (people of color) are told we have. It seems to me that once folks were allowed to marry whomever they wanted, the fight was over. People celebrated a hard fought win, and failed to keep fighting for queer folks, trans folks, and queer/trans folks of color. Consider this -- There is a reason that Soul Friday, Black Pride, and other pride type events that are specifically FOR BIPOC exist. In my opinion, it is because folks who are not white/cis-gender/upper-middle class are not welcome in traditional or mainstream pride events. Black pride has been around since at least 2000.... I'm unsure of the official start date. Events like this popped up, as a result of the police being allowed back in the parade/in uniform, despite the requests of numerous queer and trans people of color. Another event that is happening today, as a result of the recent actions of mainstream pride not being a welcoming or safe community for POC. I'm no history expert, but from what I understand, Pride parades started in remembrance of the stonewall riots -- riots that started after police violently raided and attacked folks at the Stonewall Inn. Queer folks, trans folks, and QTPOC (queer and trans people of color) fought back. It is said that Marsha P. Johnson, an African American Trans Women, threw the first shot glass. Her, Silvia Rivera (another trans women) and countless others fought back in riots that lasted 3 days. Let me reiterate this -- the pride parade that we know today is a result of a police attack on queer folks/trans folks/people of color. These are the very same people whose voices and requests for safety are ignored every day, including from within the community that is supposedly inclusive and welcoming to all. When black people, people of color, and trans people say that they don't want uniformed police in the parade this year, (I believe) it's not because folks are trying to make an already divided community split farther apart. It is because history has shown us that black people, people of color and trans people are not safe or protected around police. When the pride committee reversed their decision and re-invited uniformed police to lead the parade, it feels like once again, the voices and safety of the queer, trans and POC community are being ignored. We are already ignored and oppressed by so many other systems and communities, to have this happen (seriously, yet again) in the community that claims to be inclusive/welcoming to all -- is not the least bit surprising. Rather it reaffirms that while pride originated from folks "like us" it is not (and has not been for a long time) "for us." **Please note that I do not speak for or on behalf of the BIPOC (Black, Indigenous, People of Color) Queer or Trans community. These are my own feelings, words and experiences. I am a queer, cis-gender person of color who resides in Saint Paul. Hey folks! We're going to focus on endurance this summer....in whatever way it means to you! 1. Set a goal that makes sense to you, with the end date being in late summer/early fall (i.e. sign up for a wheelchair race, commit to exercising once a week, register for a 5k or an ultra marathon, decide to explore a new trail each week, eat breakfast every day, etc...). Anything that is a goal that you can actively work towards over the summer. 2. If you want to, share your goal with the group. Let us know how we can support you. You want a cheering section halfway through your race? Count us in! Interested in a workout partner or doing a meal share? Share out and we can likely help with that too. Want someone to call and just check in with? We got you. If you don't want to share your goal -- that's fine too. Even if we don't know what it is, know that there are a lot of other folks who are also setting goals -- so you've got a community of folks working to build endurance. special guests! ), and Sunday August 6th in the late afternoon/early evening. Locations will be announced sooner than later. Each event will have multiple options for you to engage in building endurance -- whether that's running 10 kilometers, identifying 10 plants, meditating for 10 minutes, or simply showing up and checking out what we're all about. Cheers to a rad, healthy and beautiful summer spent outdoors! Trying to get some activity in after a long day of meetings (for some of us). Photo by Laura D.
It's going to be 49 degrees outside today. When we first envisioned this weekend's event, it was a sunny day, where people could relax at "the monument" and honor their loved ones. But, at 40 something degrees, it's too cold! Rather than cancel, we've moved the location down to Hidden Falls, so that we can have a bonfire in addition to all the other things we had planned (short meditation, nature books, frisbee/football, snacks, etc...). We hope to see you there! If you get lost or can't find us, call 651.295.2773. Guided meditation will be just a few minutes long (we think), and will take place around 6:30ish. Feel free to bring food, games, etc to share. A lot of times, folks think about spending time outdoors as something that has to be active. Something we need stamina, equipment and talent to be able to do. Well, that's not always the case. This Sunday, we invite folks to come spend time outdoors and remember the ones that they love. Next Wednesday marks the 1 year anniversary of the passing of my #1 homegirl, Ardes. She was 93 years old, and was my best friend. I never met anyone like her, and doubt I will again. When she passed away, my heart was broken. I still miss her -- and cry once a week (give or take). I know I'm not the only one who is missing someone or having a hard time right now. We are in some tumultuous times -- and now more than ever, we should be able to find safe space outdoors to mourn our loved ones, celebrate life and build/sustain community. Join us this Sunday (May 21st) at 6pm at Hidden Falls in Saint Paul to simply spend time outdoors and honor the people in our lives -- in whatever ways make sense. We will have a short (non-religious) guided meditation around 6:30pm. Please note that the location has changed from The Monument (Summit and River Road) to Hidden Falls, so that we can stay warm with a bonfire. Since we will be at Hidden Falls, know that there is easy access to the river, but the river is likely very high and fast right now. While we encourage folks to go check out the water, we ask that you do so with caution. It probably won't be the best day to fish. PS if you haven't lost anyone or aren't feeling down -- come anyway. There's lots to explore around "the monument" and coming together (even to be alone) is how we build community and become stronger. You Have 20K for a Car, so you buy.....? HELP!! You "need" a car and have a budget of no more than 20k. You could go higher, but don't really want to -- the lower the price, the better. Something you can see well out of. "Good" Gas Mileage (i.e you just sold a car named Salvador, who got about 37mpg city/highway combined, and while you know you won't get this same thing necessarily, you sure like not having to always fill up your tank). And it doesn't make sense to get a gas guzzler -- does it? A hatchback/Wagon/SUV/Crossover so you can carry what you need and not have a small trunk be an issue or a buzzkill. Decent ground clearance so you aren't scraping bottom like you did with Salvador when the streets weren't plowed well or there were big ruts in the road. Something extra fly (because you are a bit of a diva) -- with good speakers, slick technology, a roof rack that is built in and includes something to tie a canoe down to, and enough room to throw your camping gear in. Something NOT made in America, cuz just like me -- there are pretty rad things that are not made in America. There's a trailer hitch in case someone donates a bunch of canoes and a trailer to Fiwygin Outdoors, you can pull all those vessels using your own vehicle. AWD. You know the secret about snow tires (getchu some if you don't already). What do you get? Help me please! I've been fortunate to borrow my mom's car for the better part of 2 weeks. I need to give this woman her car back and quit pretending like I'm gonna bike everywhere now that I sold my car. I've been consumed by consumer reports, carsoup.com, autotrader.com, etc... I need to make a decision and can't seem to do so! Any advice y'all can share, would be much appreciated! Fiwygin Outdoors Turns 1 Year Old! Celebrate with us on April 9th! A year ago today, Fiwygin Outdoors came to life as we had our very first event! It was cold and I was underdressed, but it was a great start to this idea I had long dreamed of. Our first event was April 2, 2016 at the Eloise Butler Wildflower Garden in Minneapolis. From our first event with 5 people, to our largest event this February with upwards of 50 people, we have grown intentionally. Fiwygin Outdoors started out as a group to ensure that people who are underrepresented in the outdoors know that they have a safe place to engage in green space. While all are welcome, we continue to extend an extra invite to POC, Indigenous people, LGBTQ people, and people with limited income/resources/experience/mobility. That is the foundation of this group -- ensuring that underrepresented folks find safe, accessible, meaningful and sustainable ways to spend time outdoors. We invite you to join us for our 1 year birthday party at Theodore Wirth Park, where it all began a year ago. What: Keith will be taking folks geocaching throughout the park. If the weather is decent, we'll likely bring a canoe. Feel free to bring yard games, kites, bikes, naturalist guides, or anything else you want! We will bring snacks -- perhaps even a cake! Who: Anyone who wants to spend time outside -- with an extra shout out to those who are historically underrepresented in outdoor spaces. Monetary donations to pay for supplies, snacks, equipment/gear: PayPal.Me/FiwyginOutdoors. Donating new/gently used gear: such as canoes, life jackets, warm weather clothing, hand warmers, a small trailer, fishing gear, rain gear, nature guides, etc. Please reach out to FiwyginOutdoors@gmail.com if you have an interest in donating gear. We thank you again for all of your support over the last 12 months. We look forward to this second year, in which will will develop a leadership team, get more support for (and from) the community, have at least one overnight adventure, and will continue to grow our program intentionally and sustainably. We'll see you on April 9th! Join us for all or some of Fiwygin Outdoors + the 13th Annual Celebration of Winter, on Saturday, February 18th. We'll start at Crosby Regional Park for some snowshoeing/exploring/(perhaps) fire building at 2pm. At 3:30, we'll head to Summit Brewery, where the taps flow freely and kids are welcome! There are two entrances to Crosby Regional Park. Go to the one near Watergate Marina (2595 Crosby Farm Rd, St Paul, MN 55116). Crosby is part of the Great River Passage, and is a beautiful space to play outdoors and build community. All are welcome to come -- kids, friends, leashed pets, etc. Not sure if dogs can come into the brewery, but they sure can come to Crosby! Every year, I collect funds and supplies for a cause. This year I'm welcoming donations towards Fiwygin Outdoors, the program that I officially launched in April 2016 that ensures spending time outside is accessible to everyone. To donate, click HERE. What will this money go to? To help pay for park entry fees, snacks for our events, equipment for participants, and anything else to make sure that creating sustainable and meaningful connections to the outdoors can be free of barriers. Can't donate? That's okay! Join anyway, in whatever way makes sense to you. Come for the outdoor fun. Come for the tasty drinks at Summit. Come to see me and wish me a happy birthday. Hope to see you on the 18th! Give a holler if you have any questions -- fiwyginoutdoors@gmail.com or on my cell phone. Mixing things up a bit for our January event. Rather than do something on our own, we'll be joining the activities at Fort Snelling for Winter Trails Day 2017! Get ready to ski, snowshoe, hike, ice fish and more -- lots of ways to engage and have fun! Plan to meet near the front entrance (ranger station) at 1:30pm. Fiwygin Outdoors will cover the cost of the $5 park entry if you don't have a park sticker on your vehicle. If you need warm weather gear, let us know ASAP so we can figure something out. Also, tentatively save the date for February 18th -- for Fiwygin Outdoors + Asha's 13th Annual Celebration of Winter! We'll be going all out! For December's event, we went around the Highland Neighborhood and checked out a bunch of free libraries, as they are everywhere! We went in two groups -- a morning one and an afternoon one. Several new folks came, including some that don't really "do the outdoors." Great conversations were had, and we finished each outing with donuts at PJ Murphy's Bakery! Yum! Yesterday we hit up Como Lake to spend time outdoors. Our group was about 20 people strong, including kids and a puppy. Since the snow melted already, we decided to spend time together picking up trash around the lake. We picked up quite a bit! We enjoyed hot chocolate, clementines and other snacks before and after the clean up. Friends met one another and created community. It was a wonderful sight. Now more than ever it is important to spend time outdoors, take care of what we have, and be kind to one another. Little people make our events so fun! About half the group. Additional folks joined us as the morning went on. Our next event will be December 10th. We hope you will join us. October 8th - Fiwygin Outdoors is in Saint Paul! Fiwygin Outdoors next event is Saturday, October 8th at 9:30am. We're mixing up the time a bit - in hopes some new folks can join us. Plan to meet at 9:30am at Indian Mounds Park (at the building on Mounds Boulevard and Earl Street). Aside from taking a trek for about a mile, while checking out over 20 species of trees and 2,000 year old Indian Mounds...we will also be having a contest for "best fallen leaf." We can't yet share what the winning prize will be, but rest assured it will be good! The weather is getting colder, so plan ahead and bring a sweater/jacket. If you need cold weather clothes, let us know in advance and we will make sure you're covered....literally. Let us know if you have any questions. If you've come to a Fiwygin Outdoors event before, we hope to see you again -- and please bring a friend! If you haven't yet been to one of our events, there's no better time than this weekend to join us. All our events are free, accessible, and all are welcome/encouraged to come -- especially those who are underrepresented in outdoor spaces (i.e. POC, LGBTQ people, people with limited income/resources/experience/mobility/etc...). Hope to see you this Saturday! Please RSVP on Facebook (if you can), so we know how many snacks we should bring. If you can't join us, but are spending time outdoors that day, post a photo of the best leaf you can find with the hashtag #FiwyginOutdoors to join the fun! See You August 6th at the Wildflower Garden! Hello everyone! Fiwygin Outdoors is happening this Saturday, August 6th at 1pm at the Eloise Butler Wildflower Garden. You can see the official facebook event HERE. We will be taking a stroll through the wildflower garden, with the potential of joining the Birding Basics class that starts at 1pm. We will bring a pair of binoculars and a few books about birds and plants. Bring your own too if you have them. Kids, strollers and friends are encouraged and totally okay. No pets allowed unfortunately. There is no cost to attend the wildflower garden, but it is paid parking at the wildflower garden parking lot. Parking for 2 hours is probably $3-4. We will have some money to help cover parking costs for those who would like to park near the entrance of the garden. If you want to park for free at the beach house (3200 Glenwood Avenue), plan to meet there at 12:30, and we can walk/skip/wheel our way over to the garden parking lot, which is less than a mile away and up hill. As always, Fiwygin Outdoors will provide snacks for everyone, and a prize for best #fiwyginoutdoors photo. Please bring a bottle of water so you don't get dehydrated. Let asha know if you have any questions. Hope to see you on Saturday! If you get lost, call 651.295.2773 and asha will try and help. Don't forget to invite your friends! All are welcome. We had an awesome Fiwygin Outdoors event yesterday. As Fiwygin Outdoors continues to grow, we want to make sure we are reaching the folks this group was intended to reach. Regardless of if you have attended a Fiwygin Outdoors event, please take a few minutes to take this survey. It will help us better understand who is spending time outdoors, what the barriers are that folks are experiencing, and what we can do to make spending time outdoors more accessible and inclusive. Thanks! We recently purchased a new canoe, so we are selling "Rachel," a 16 foot Old Town Penobscot canoe. Rachel is 58lbs, holds up to 1100 lbs, and is great on moving or still water. We've had many memories with Rachel (i.e. 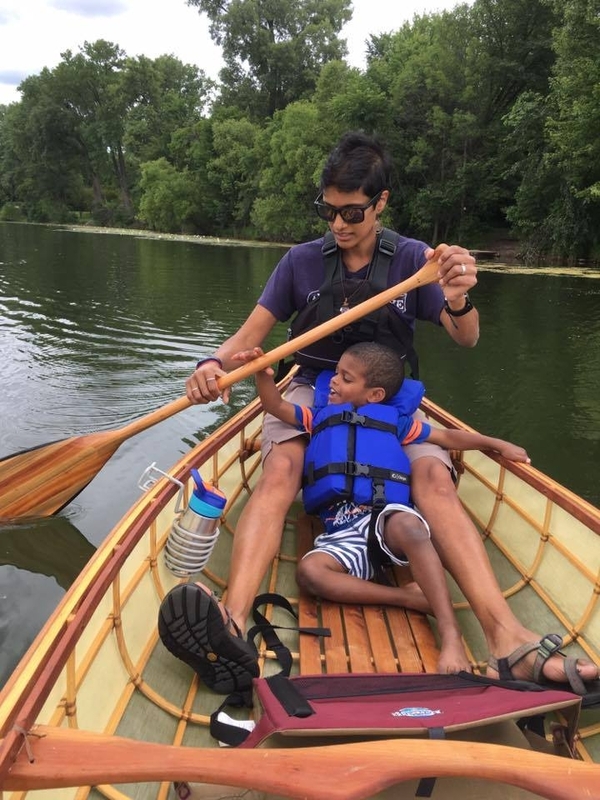 a paddle down Minneahaha Creek, a day trip on the Crow River, a blood moon eclipse viewing party on Cedar Lake, many boat picnics on Brownie Lake, and a proposal no less)! Rachel retails new for $1800. She is well used, so we are selling her for $600. She comes with a small Indian Flag sticker on one side, and a small Croatian flag sticker on the other. There is one considerable dent in the bottom, but overall, the boat is in good condition and is a great canoe for anyone who wants to be out on the water. We could sell Rachel on Craigslist, but our hope is to sell her to a friend - someone who would be a good steward and appreciate Rachel as much as we do. Please take a look, let me know if you want to take her out for a test paddle, and share with friends who might be interested. Who: You. Anyone, and everyone. Especially the folks who have ever felt like they didn't belong outdoors, weren't welcome in outdoor spaces, or are afraid to spend time/be active outside. What: Anything outdoors. Want to run 5 miles? Go for it! Want to hike 100 meters? Cool! Want to ride a mountain bike or paddle a canoe? Why not (we'll have 2 bikes, and 1 canoe to share -- bring yours too if you have one). Want to sit on a bench and draw some of the beautiful wildlife? Please do! Have kids (or not) and want to play on the playground? Why not?! Want to go fishing? Wirth Lake is right there (and if you're under 18 you don't need a fishing license). Want to play volleyball or basketball? Bring a ball and a few friends! Interested in checking out the spring flowers at the wildflower garden? You can - and we have a naturalist to serve as your guide. Where: Theodore Wirth Park - meet at the Beach House (3200 Glenwood). When: Noon on May 7th. Why: Because spending time outdoors is good for the body, mind, and spirit. And Fiwygin Outdoors is all about making spending time outside a safe, welcoming, and inclusive place for all folks to thrive. 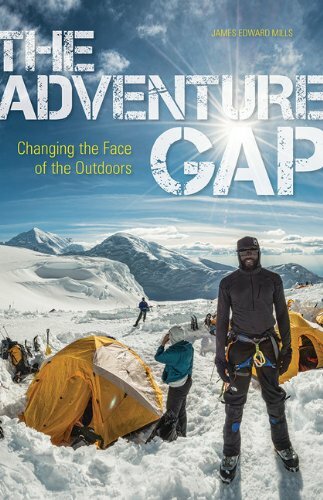 Bonus: Whoever posts the best photo with the hashtag #FiwyginOutdoors on Saturday during the event - will win a copy of James Mills "The Adventure Gap -- Changing the Face of the Outdoors." Snacks will be provided for all who attend. Hope to see you on Saturday, May 7th at noon. All are welcome and encouraged to come exactly as they are. PS - If you are planning on watching the Kentucky Derby -- rest assured, it doesn't start until several hours after Fiwygin Outdoors. You'll have time to do both! This Saturday is the first ever Fiwygin Outdoors event! What is Fiwygin Outdoors? Well, first of all, it's pronounced the same way you'd say "fusion" in English or "few-zhin" if you spelled it out phonetically. Secondly, it's a concept/group in response to and in solidarity with all the people who have ever felt like they didn't belong or fit in outdoors. A big part of the purpose of Fiwygin Outdoors is to eliminate the fears and barriers that folks have to getting outside, and making it fun, accessible, and welcoming to all people! Who: Anyone. But especially those who don't usually feel comfortable or welcomed in the outdoors or outdoor activity. Nervous about going to things like this alone? Bring a friend! What: An hour (or more or less if you want) to play outside, alone or ideally with other people. You can run, walk, play frisbee or football, fish, birdwatch, visit the wildflower garden and more! There will also be a photo challenge, which will be explained the day of. Where: Meet at the beach house on Glenwood at Theodore Wirth Park in Minneapolis. When: Saturday, April 2 at noon. Why: Because there's a lot to do and see outside, and sometimes we don't always feel safe, comfortable, welcomed, or knowledgeable to do these things on our own. Saturday (and every event thereafter) will be a space/group that is intentionally welcoming and safe for you to come as you are, and enjoy yourself in whatever way makes sense to you. As Fiwygin Outdoors grows in popularity/attendance, there will be opportunities for more activities, overnight trips, people to take on leadership or teaching roles, and for us to really get creative with what we do! Hope to see you on Saturday, April 2nd. If you have questions, you can reach me at ashashoffner@gmail.com or shoot me a text message. 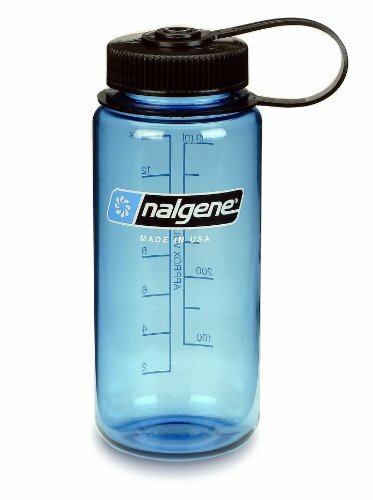 PS Don't forget a water bottle! I'll bring some snacks to share, but you may want to eat something before you arrive.